Do you have dreams of seeing the world? Do you think that traveling must be expensive? Do you want to visit exotic locations but you’re not sure where to start? I plan on proving to you that travel is possible on all budgets. More specifically, you can see a lot of the world without spending a lot of money. 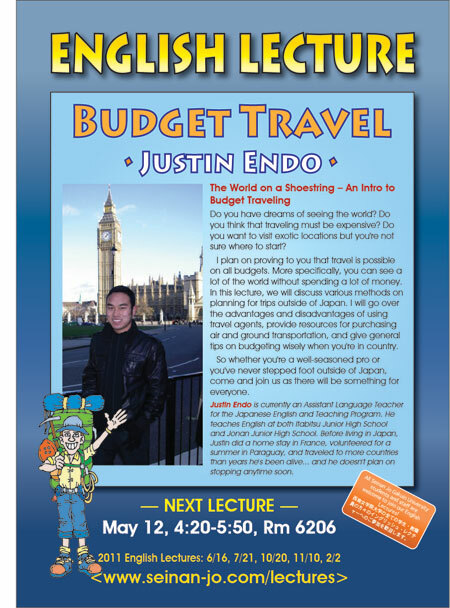 In this lecture, we will discuss various methods on planning for trips outside of Japan. I will go over the advantages and disadvantages of using travel agents, provide resources for purchasing air and ground transportation, and give general tips on budgeting wisely when you’re in country. So whether you’re a well-seasoned pro or you’ve never stepped foot outside of Japan, come and join us as there will be something for everyone. Bio: Justin is currently an Assistant Language Teacher for the Japanese English and Teaching Program. He teaches English at both Itabitsu Junior High School and Jonan Junior High School. Before living in Japan, Justin did a home stay in France, volunteered for a summer in Paraguay, and traveled to more countries than years he’s been alive… and he doesn’t plan on stopping anytime soon.